Radon is the only naturally occurring radioactive gas, which occurs from the disintegration of uranium (238U decay series). It is a chemically inert gas and has no odor, color, or taste. Soil is the main contributor of radon to the living environment. Radon gas escapes easily from the surface soils and rocks into the air through the process called exhalation and tends to concentrate in enclosed places, such as underground mines, mansions, and other constructions. Radon exhalation rate is the rate at which radon enters into the living environment through the surface of soil and rock. Entry of soil gas into the houses is distinguished as the most significant source of residential radon. Other sources of radon include building materials and water extracted from wells. Breathing in or ingestion of radon does not affect the human being directly, whereas its immediate daughter nuclide polonium is a solid, which adheres to the liner of the lungs. Since it is an alpha emitter, it damages the inner soft tissues and may cause health hazard. Hence, it is very much essential to monitor the radon activity in the soil gas and its exhalation rate. In prospect of this, several researchers conducting measurements to key out the concentration of radon throughout the globe to understand the exposure level and radiation risk to the public due to natural radiation., In the present work, one such study was carried out to see the contribution of radon activity from the soil gas toward the exposure of human being to radiation. Bengaluru is one of the fast-growing, metropolitan, and dense-populated cities of India and capital of Karnataka state. It is located at 12.97°N latitude 77.56°E longitude and covers an area of 709 km2. The geological formation of Bengaluru mainly consists of Peninsular Gneissis and includes older granite, gneisses, and migmatites, whereas the soil matrix consists of red laterite and red, fine loamy, to clayey soils. 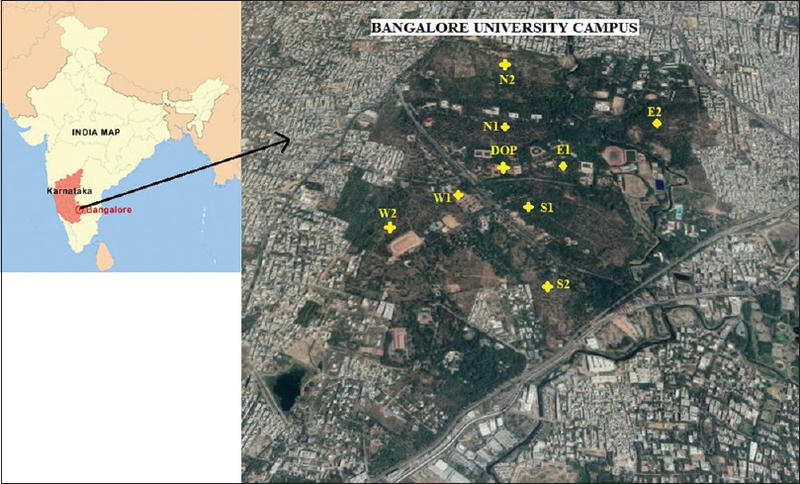 In the present work, measurements were carried out in the southwest part of the Bengaluru city – Bangalore University campus, which spreads over 1100 acres of terrine. [Figure 1] shows the sampling locations where measurements were carried out. Locations have been selected in such a way that Department of Physics (DOP) is considered as the center of the study area and rest of the locations in all four directions. 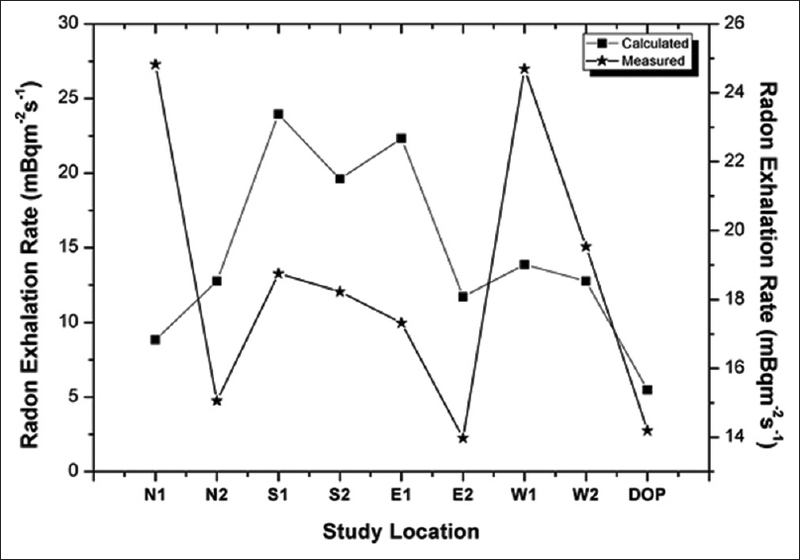 Column 1 in [Table 1] indicates location of samples collected which in turn represents the direction in which samples were collected and the sampling site numbers (Example: N1 – North direction, site no. 1). A preliminary measurement of radon concentration in soil gas was carried out in the Bangalore University campus, Bengaluru, using an active device RAD7 - a continuous radon monitor. In the present study, the soil probe technique was adopted to measure soil gas radon concentration. In this method, soil gas was drawn using a hollow metal rod inserting into the soil to a depth of 25 cm from the surface. It was further connected to a filter followed by a desiccant tube (CaSO4, W A Hammond Drierite Co Ltd.) and an inlet filter to avoid dust and moisture entering the detector and to maintain humidity <10%. During sampling, the grab mode was selected, in which samples were drawn for about 5 min and delayed for the next 5 min for the complete decay of thoron. The instrument then counts for four 5 min cycles in the next 20 min. Proper care was taken during sampling to avoid the entry of the atmospheric air. RAD7 was purged well every time before conducting the next measurement at different locations to avoid the contamination or background concentration due to the previous measurement. Where J is radon exhalation rate (mBq/m2/s), C is the radon/thoron concentration at the surface of the soil, λ is the radon/thoron decay constant, V is the total volume (volume of the inner cell of RAD7 + volume of the chamber), A is the surface area of the soil covered by the accumulation chamber, and t is actual measured time. Where CSG is the radon activity in soil gas. Where D is the eddy diffusion coefficient (5 × 104 cm2/s). Where CRn is radon concentration in air near to the soil surface, F is the global average of equilibrium factor for outdoor radon and its descendant (0.6), O is the global average outdoor occupancy factor (1760 h/y), and DCF is the dose conversion factor (9 nSv/h per Bq/m3). The values obtained in the present study are tabulated in [Table 1]. The values of radon activity in soil gas and its exhalation rates are ranged from 1690 ± 362 to 7390 ± 324 Bq/m3 with the geometric mean (GM) of 4120 ± 307 Bq/m3 and 13.97 ± 7.55–24.82 ± 8.38 mBq/m2/s with the GM of 18.13 ± 6.52 mBq/m2/s, respectively. It can be seen from the [Table 1] that the radon activity in soil gas at one of the study locations, namely DOP, is minimum which may be due to backfilling of soil during the construction work, whereas the study location S1 shows maximum value. The observed wide variation in the present study may be attributed to the underlying rock system present in the study location. According to the classification adopted by Kemski et al., 2001, the observed GM of soil gas radon concentration lies in the low radon zone (<10 kBq/m3). The radon exhalation rate and radon concentration in air near to the soil surface were calculated from the measured values of radon activity in soil gas and are found to be ranged from 5.48 ± 1.17 to 23.95 ± 1.05 mBq/m2/s, with the GM of 13.35 ± 1.00 mBq/m2/s, and 1.69 ± 0.36–7.39 ± 0.32 Bq/m3, with the GM of 4.12 ± 0.31 Bq/m3, respectively. The measured and calculated values of radon exhalation rate are shown in [Figure 2] and are well within the world average of 33 mBq/m2/s. As observed from the graph that the trend of variation of the measured and calculated radon exhalation rate is more or less the same. The AED was calculated using the value obtained from the radon concentration in air near to the soil surface and found to range from 0.02 to 0.07 mSv/y, with the GM of 0.04 mSv/y. The results show that the AED received by the public due to inhalation of radon is very much less than the recommended global average of 1.15 mSv/y. The results obtained in the present study reveal that the present study location is in the low radon zone (<10 kBq/m3) and the radon exhalation rate is well within the world average of 33 mBq/m2/s as reported in the UNSCEAR 2000. The AED calculated from the radon concentration in air near to the soil surface shows that the dose received by the public is less than that of the suggested global average of 1.15 mSv/y. Hence, the public living in the study area receive less radiation dose from the inhalation of radon. We are very much thankful to The University Grants Commission for providing the funds under the MRP scheme to bare out this research work. The University Grants Commission, New Delhi under Major Research Project vide F. No - 42-789/2013 (SR). Alenezy MD. Aliouf, Saudi Arabia using active detecting method. Natl Sci 2014;6:886-96. Beir VI. Report on the committee on biological effects of ionizing radiation. Health Effects of Exposure to Radon. Washington, DC, USA: National Academy Press, National Research Council; 1999. p. 516. Lara E, Rocha Z, Palmieri HE, Santos TO, Rios FJ, Oliveira AH. Radon concentration in soil gas and its correlation with pedologies, permeability and 222Ra content in the soil of Metropolitan Region of Belo Horizonte – RMBH, Brazil. Radiat Phys Chem 2015;116:317-20. Aswal S, Kandari T, Sahoo BK, Bourai AA, Ramola RC. Emission of soil gas radon concentration around main central thrust in Ukhimath (Rudraprayag) region of Garhwal Himalaya. Radiat Prot Dosimetry 2016;171:243-7. RAD7 Radon Detector - User Manual. Ver. 6.0.1. Billerica, MA: Durridge Company Inc.; 2018. Hosoda M, Shimo M, Sugino M, Furukawa M, Fukushi M. Effect of soil moisture content on radon and thoron exhalation rate. J Nucl Sci Technol 2007;44:664-72. Al-bakhat YM, Al-Ani NH, Muhammad Al-Ezawi BF, Ameen NH, Zahar Jabr ZA, Hammid SH. Measurement of radon activity in soil gas and the geogenic radon potential mapping using RAD7 at al tuwaitha nuclear site and the surrounding areas. Radiat Sci Technol 2017;3:29-34. Junge CE. Atmospheric radioactivity. Air Chemistry and Radioactivity. Vol. 4., Ch. 3. New York: Academic Press Inc.;1963. p. 209-20. United Nations Scientific Committee on the Effects of Atomic Radiation, (UNSCEAR). Report to the General Assembly with Scientific Annexes. Vol. 1. United Nations, New York: UNSCEAR; 2000. Kemski J, Siehl A, Stegemann R, Valdivia-Manchego M. Mapping the geogenic radon potential in Germany. Sci Total Environ 2001;272:217-30.